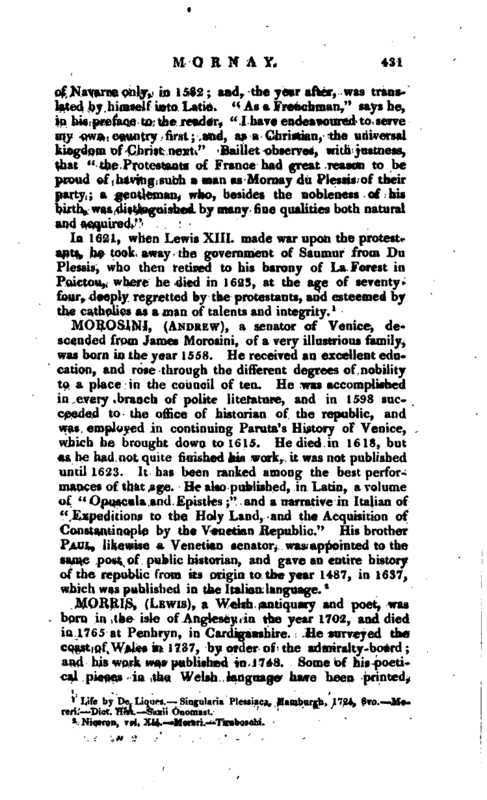 , lord of Plessis Marly, an illustrious French protestunt, privy-counsellor of Henry IV. and governor of Saumur, was born at Buhi or Bishuy, in the French Vexin, in 1549. He was descended from an ancient and noble family, which had, in course of time, divided itself into several brandies, and produced many great aiKi eminent men. 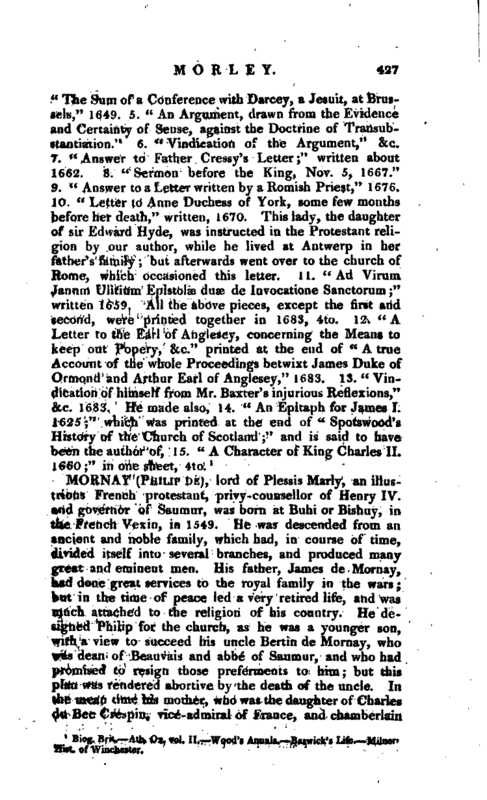 His father, James de Morn ay, had done great services to the royal family in the wars; but in the time of peace led a very retired life, and was much attacnecl to the religion of his country He designed Philip for the church, as he was a younger son, with a view to succeed his uncle Bertin de Mornay, who was dean of Beauvais and abbe of Saumur, and who had promised to resign those preferments to him; but this plan was rendered abortive by the death of the uncle. In the mean time his mother, who was the daughter of Charles du Bee Cre^pin, vice-admiral of France, and chamberlain | to Francis II. was secretly a protestant, and had taken care to inspire her son insensibly with her own principles. His father died when he was not more than ten years of age; and his mother, making open profession of the protestant religion in 1561, set up a lecture in her own house, xvhich confirmed hirn in it. His literary education was all the while carrying on with the utmost care and circumspection he had masters provided for him in all languages and sciences and the progress he made in all was what might be expected from his very uncommon parts and application. In 1567, he was obliged to retire from Paris, where he was pursuing his studies, on account of the commotions which were breaking out, and soon after took up arms, and served a campaign or two. 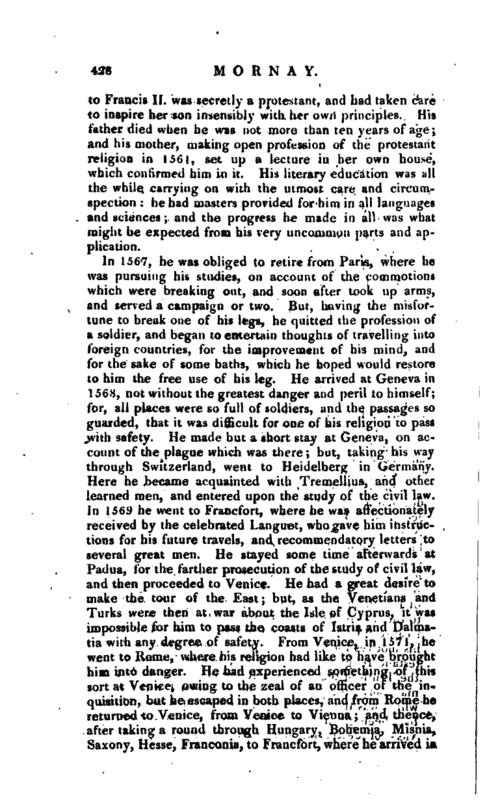 But, having the misfortune to break one of his legs, he quitted the profession of a soldier, and began to entertain thoughts of travelling into foreign countries, for the improvement of his mind, and for the sake of some baths, which he hoped would restore to him the free use of his leg. He arrived at Geneva in 1568, not without the greatest danger and peril to himself; for, all places were so full of soldiers, and the passages so guarded, that it was difficult for one of his religion to pass with safety. He made but a short stay at Geneva, on account of the plague which was there; but, taking his way through Switzerland, went to Heidelberg in Germany. Here he became acquainted with Tremellius, and other learned men, and entered upon the study of the civil law. In 1569 he went to Francfort, where he was affectionately received by the celebrated Languet, who gave him instructions for his future travels, and recommendatory letters to several great men. He stayed some time afterwards at Padua, for the farther prosecution of the study of civil law, and then proceeded to Venice. He had a great desire to make the tour of the East; but, as the Venetians and Turks were then at war about the Isle of Cyprus, it was impossible for him to pass the coasts of Istria and Dalmatia with any degree of safety. From Venice, in 1571, he went to Rome, where his religion had like to have brought him into danger. He had experienced something of this sort at Venice, owing to the zeal of an officer of the inquisition, but he escaped in both places, and from Rome he returned to Venice, from Venice to Vienna; and thence, after taking a round through Hungary, Bohemia, Misnia, Saxony, Hesse, Franconia, to Francfort, where he arrived in | Sept. 1551. Though he was very young when he set out upon his travels, yet he never suffered the man of pleasure to get the better of the philosopher; but made that profitable use of them, which a wise man will always make. He examined every thing that was curious in every place; and, that nothing might escape him, attentively perused not only the general history of the countries, but also the histories of each particular town and province through which he passed. Nor was he only attentive to their antiquities, but remarked also whatever was worth notice in the manners, customs, policy, and constitution, of each. In 1572 he went into Flanders, to survey the situation, the strength, the fortifications, and garrisons, of that country, and afterwards passed, over to England, where he was graciously received by queen Elizabeth; for, his parts, his knowledge, his uncommon capacity for the management of great affairs, had spread his name far and wide, and made him courted, especially by the great. In 1575 he married, and published the same year a treatise “Concerning Life and Death;” for, though often employed in civil affairs, and oftener solicited to engage in them, yet he passed much of his time in reading and writing. 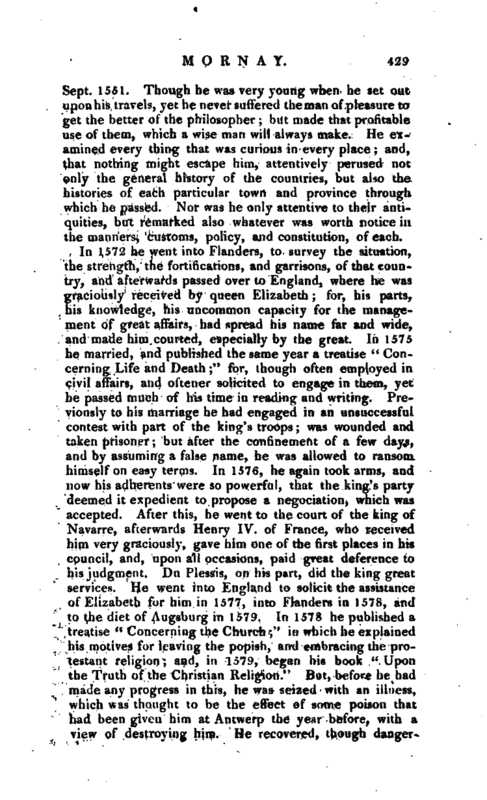 Previously to his marriage he had engaged in an unsuccessful contest with part of the king’s troops; was wounded and taken prisoner; but after the confinement of a few days, and by assuming a false name, he was allowed to ransom himself on easy terms. In 1576, he again took arms, and now his adherents were so powerful, that the king’s partydeemed it expedient to propose a negociation, which was accepted. After this, he went to the court of the king of Navarre, afterwards Henry IV. of France, who received him very graciously, gave him one of the first places in his council, and, upon all occasions, paid great deference to his judgment. Du Plessis, on his part, did the king great services. He went into England to solicit the assistance of Elizabeth for him in 1577, into Flanders in 1578, and to the diet of Augsburg in 1579. In 1578 he published a treatise “Concerning the Church;” in which he explained his motives for leaving the popish, and embracing the protestant religion; and, in 1579, began his book “Upon the Truth of the Christian Religion.” But, before he had made any progress in this, he was seized with an illness, which was thought to be the efiect of some poison that had been given him at Antwerp the year before, with a view of destroying him. He recovered, though | dangeronsly ill, and continued to do service to the king of Navarre and the protestant religion. From 1585, when the league commenced, he was more intimately connected with the affairs of the king; and, in 1590, was made his counsellor of state, after having been invested with the government of Sauinur the year before. 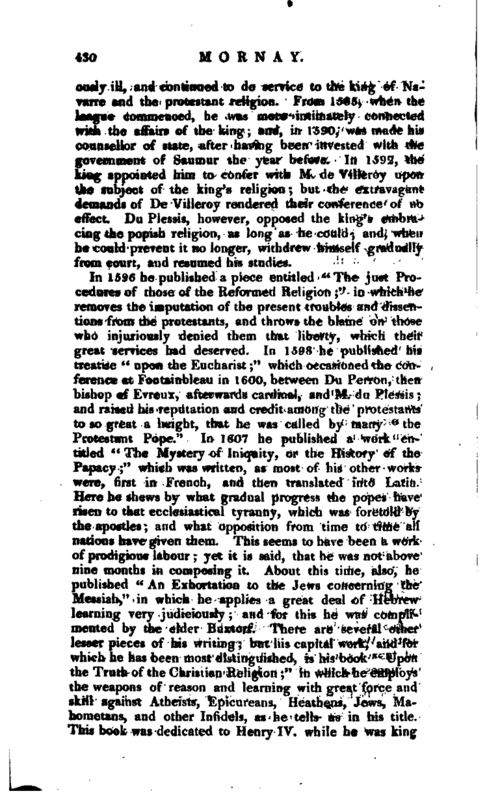 In 1592, the king appointed him to confer with M. de Villeroy upon the subject of the king’s religion; but the extravagant demands of De Villeroy rendered their conference of no effect. Du Piessis, however, opposed the king’s embracing the popish religion, as long as he could and, when he could prevent it no longer, withdrew himself gradually from court, and resumed his studies. Life by Pe Liques. Singularia Plessiaca, Hamburgh, 1724, 8vo.--.—Moreri. —Dict. Hist.—Saxii Onomast.